As a goblin you are much better off if you focus on the process. Chasing short term results is a nice way to undermine yourself. Our goal is to maximize our long term liquid gold. So you need to avoid focusing on any short term noise when deciding what to do. This is the important underlying point. As long as you set up TSM correctly you will be guaranteed to get the profit margin you desire if your items sell. This is the entire point of using TSM. Since we KNOW that we make a profit each time we make a sale, we can focus a lot LESS on how well any given day went. Those of you who follow me on twitter will probably have seen some very impressive mailbox hauls. While mailboxes in the 400k+ range are cool, they are not the norm. The main metric we care about is the average daily sales. 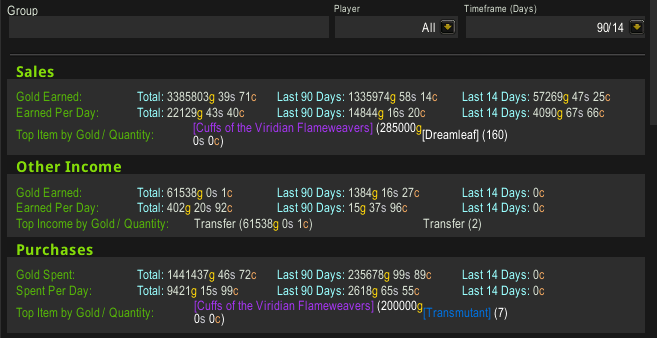 If you are flipping high-end BoEs or battle pets the variance will be very high. I can have 500k mailboxes and 10k mailboxes on the same realm 2 days apart. Neither of those two data points will make me change my process however. Obviously we need to make changes from time to time. And those changes should be based on what is most profitable. The main point here is that they should not be based on 1 day of data, or maybe even one week. Some markets have relatively slow sales and it will take a while to know if it is working. It took me at least a month to get really rolling with BoE flipping in my zero to one million gold challenge. Even though I was losing gold in the beginning I did not stop, because I knew that the market required you to put in a sustained effort to get started. In the summary pane of TSM you can look at your sales over a ton of different time horizons. You can break it down to separate groups. In the screenshot below you can see the all time, 90 day and 14 day average on one of my realms. We can see that my sales have been quite a bit slower lately than they were more than 3 months ago. At the time I logged in today it was a week since the last time I reposted, so no wonder that my sales are slower. This information clearly tells me I should repost my auctions more often or increase my activity level. The 14 day average is almost too small a time frame to really say anything interesting. My last 30 days are slightly better than my 90 day average which tells me that it’s most likely just my last week that is pulling it down. Overall It seems like I’m doing quite well on this realm. Remember that my Patreon will go live on Wednesday! This is your chance to get access to some really cool rewards!